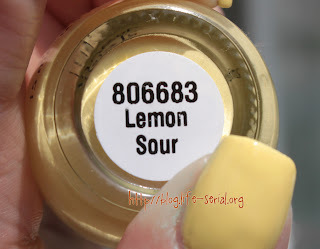 The one with Finger Paints Lemon Sour! Good morning! It's the first day of Spring Break around our house :) A whole week with my son home! We have a bunch of fun stuff planned, so I'm excited! Today I have another of the new Finger Paints Gumdrops and Lollipops collection! This is the final one in the collection - Lemon Sour - a muted yellow creme. And my least favorite. It just looks...thick on the nail. I just don't like this bottle of polish - color and formula. What do you guys think? What about the collection overall? Do you have a favorite of the collection? I think mine, overall, considering everything, is Grape Gumball!